Whether they're mild, severe, or splitting to the point of a migraine that keeps us from getting out of bed, headaches are never a pleasant or easy thing to deal with. When we get headaches, many of us have routines to help us overcome them — pain reliever, water, salty or sweet foods, whatever works for us. But did you know that dogs are potentially as susceptible to getting headaches as we are? If you wonder if your dog may have a headache, what symptoms should you look out for, and what solutions can you offer your canine friend to make them more comfortable? Aside from an almost guaranteed way to make your day at least a little bit harder, a headache is defined as an ongoing pain in the head and occurs when those parts of your brain that are sensitive to pain become overstimulated, according to Mayo Clinic. The brain contains nerves, blood vessels, and muscles, all of which have the potential to feel pain, which causes our heads to take on an achy feeling. Headaches can be caused by a number of primary or secondary issues, including dehydration, neck pain, too much alcohol or nicotine, other illnesses, and even stress, to name a few. Headaches are very common and can usually be treated with over-the-counter or home remedies, although recurring or chronic headaches may be a sign that something else is wrong. It's awful to think about your canine companion suffering silently through an achy head while we remain none the wiser. While there is little research on the subject, namely the causes of headaches in dogs, one thing that's for sure is that, because they too have brains made up of muscles, blood vessels, and nerves, they do have the capacity to get them. 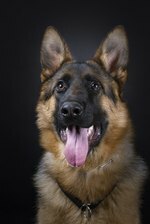 Like any other part of the body, dogs are definitely sensitive to the same physical pains people experience, and their precious heads are no different. The causes of dog headaches can never be known for sure, but Innovative Veterinary Care lists what they believe could be causes of secondary headaches, or, headaches that come about as a symptom of another issue. It will, of course, depend on your pet and her circumstances, but secondary headaches may be caused by yanking a leashed collar around her neck too hard, heat exhaustion, dental issues, stress due to sudden changes, and chemicals like carbon monoxide, pesticides, and even certain food additives like nitrites. So we know that dogs can potentially feel headaches, but how can you tell if your dog has one? Innovative Veterinary Care goes on to list symptoms commonly seen in dogs that may have experienced pain due to a headache. Overall, a dog with an achy head will seem fussy, standoffish, and not really want to be touched or engaged with — pretty much exactly the same way we feel when we have one. Behaviors like flinching when you reach to pet your dog's head, a lowered or irregularly elevated posturing of the head, an excessive need to rest or an unwillingness to go outside, frequent blinking, and furrowed brows are among those listed. Because headaches can sometimes reach into the neck area, your dog may also crouch out of the way or resist having a collar put on, as that can lead to more irritation. Fortunately, there are headache treatment options out there if you suspect that your dog is suffering from a headache. Chiropractic adjustments and acupuncture have been shown to relieve pain symptoms in animals that could be related to headaches. All-natural arnica can also provide non-toxic relief of headache-like symptoms. If your dog will allow you to apply a cold pack of ice on his head or a warm compress on the back of his neck, those may help to alleviate headache pain as well. Finally, it's important to state that, unlike us, dogs should not be given drugs containing acetaminophen, like Tylenol, to relieve their headaches. VCA Hospitals warns that even small doses of acetaminophen can be very harmful to dogs as their bodies don't metabolize it the same way that we do. If it seems like your dog is suffering from a headache, try offering him what you would yourself in the situation: access to plenty of water, quiet time, and lots of rest. Why Do Some Cats Always Think Their Food Bowls Are Empty? Why Does My Cat Bite My Hair?